McDonalds warns global weakness means its clients have started saving on burgers. The fast-food chain posted disappointing results after years of double digit increase in profits each quarter. The fast food giant delivered second quarter profits of $1.4bn on Monday – a 4% increase on the same period last year. It fell short of analysts' forecasts marking a dramatic slowdown in growth. Revenues rose 2% to $7.1bn. That’s below the $7.9bn revenue expected by analysts polled by Thomson Reuters. Although the company’s shares gained more than 13 per cent in the year to date, it has lagged behind the market and some of its competitors. Burger King shares have risen nearly 20%, while Wendy’s shares are up almost 22%, according to the FT. The company’s shares lost 3.5% on the back of the news. 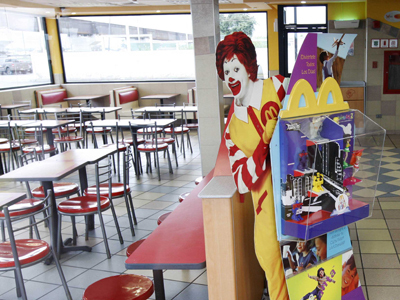 McDonald's chief executive Don Thompson says the economic crisis was biting into sales. McDonald's global sales increased by 1% for the 1st quarter, primarily due to the U.S. that accounts for a third of total sales. U.S. sales increased by 1%, Europe saw 0.1% fall, Asian sales decreased by 0.3%. Growth is also slowing down in Russia, where the fast-food giant still posts double digit results business daily Vedomosti reports. 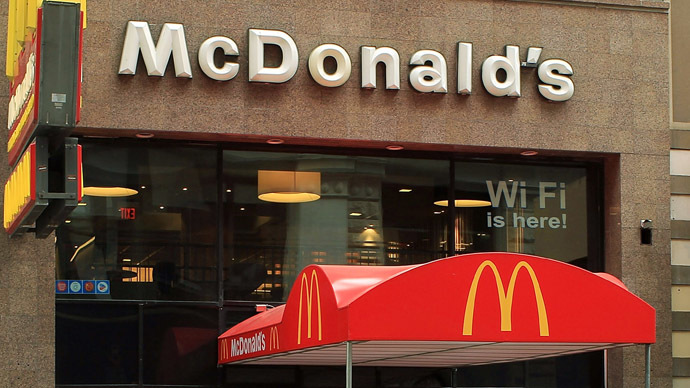 Last year sales of its two Russian subsidiaries, LLC McDonald's and CJSC Moscow-McDonald's increased by 19.6% to 55.4 billion rubles, while the year before - they were up 24.8% (year on year), according to SPARK data. Vedomosti quotes Euromonitor International. However the competition is increasing : Burger King market share has risen to 3.1% in 2012 from 1.5% in 2011. Subway takes up to 2,7%. Euromonitor estimates the Russian fast-food market at $9.4bn last year, Vedomosti reports. This year McDonald's will open fewer restaurants than planned and reduce capital expenditure, Vedomosti quotes Thompson. Responding to the "headwinds of the world economy" McDonald’s has tries to attract customers through cheaper deals on the menu and promoting combined dinners in Europe, the FT reports.